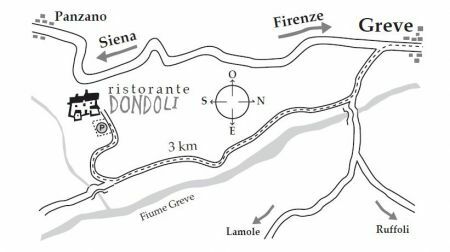 Click the image above for a larger map showing how to reach "Ristorante Dondoli"
Pass through Greve in Chianti in the direction Siena. 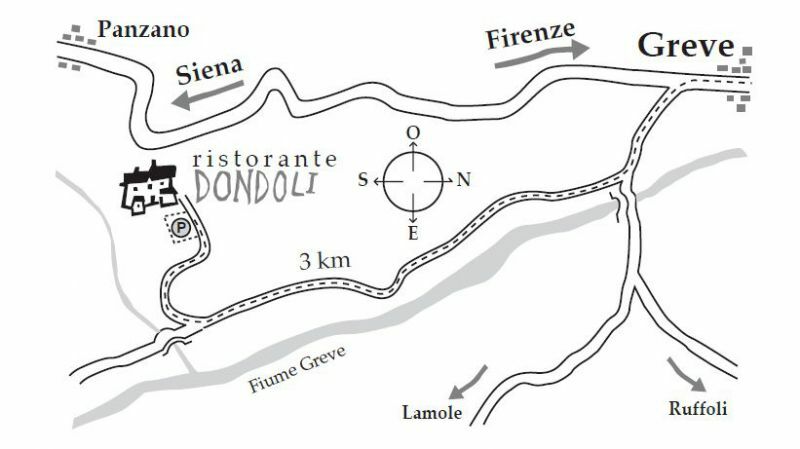 About 1 km beyond Greve, turn to your left towards Lamole. Before the first little bridge, turn to your right and drive along the dirt road. After ca. 3 km, you will see on your right the sign “Dondoli”. Put the car into the first gear to drive up the uphill road (about 100 m) and park just below the restaurant. Pass through Panzano in the direction direction Greve in Chianti. At the end of the winding part of road, turn on your right, direction Lamole. Before the first little bridge, turn to your right and drive along the dirt road. After ca. 3 km, you will see on your right the sign “Dondoli”. Put the car into the first gear to drive up the uphill road (about 100 m) and park just below the restaurant.